Very many congratulations to OLIVER GREENALL and ISABEL TOMPSETT on their emphatic wins of their respective Gentleman and Lady Amateur National Hunt Jockey Championships for the 2009/10 season which saw Oliver complete the season with a huge tally of 31 winners and Isabel sign off with 12 winners. 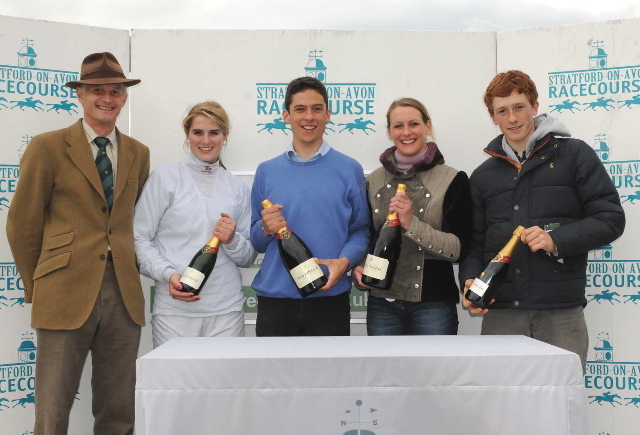 Both champions were presented with their traditional magnum of Bollinger by AJA Vice President Dr Philip Pritchard at the last jump race meeting of the season today at Stratford, accompanied by their runners up who also received bottles of champagne – SAM TWISTON-DAVIES on 13 winners and GINA ANDREWS on 7 winners. Very many congratulations to them and indeed to all AJA members who have ridden winners under Rules this season. 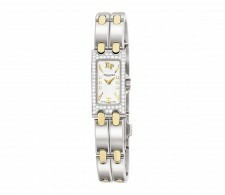 A full list of these appears under the Championship Tables link on the left of this site. 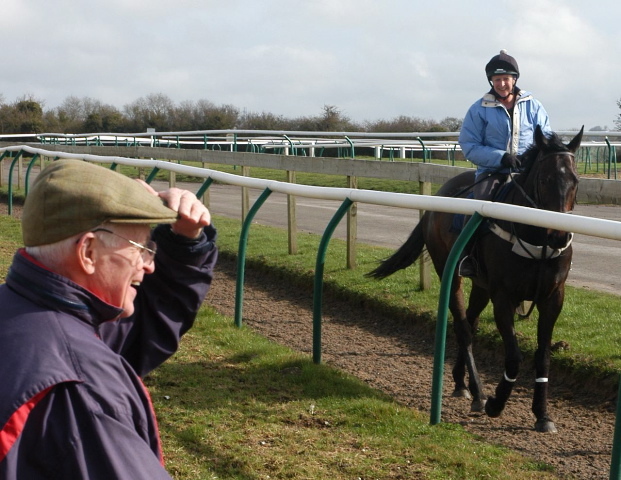 Would YOU like to ride in a charity race at Newbury? Thurday 10th June sees the annual charity race at Newbury in aid of Spinal Injuries and this year is not without its tale of courage. Meregan has now raised nearly £14,000 which is being divided between Against Breast Cancer, Spinal Research and Spinal Injuries Association. Please help Meregan achieve her goal by donating on-line at http://uk.virginmoneygiving.com/Meregan. With this season’s amateur jumps season ending at Stratford this Saturday, Oliver Greenall and Isabel Tompsett are set to collect their champagne in the annual presentation to be held there on Saturday night with Oliver on a huge tally of 31 winners so far this season and Isabel fresh from riding a winner yesterday at Market Rasen which takes her tally to 12. Carlisle to host £15,000 ladies race and Jedward on 25th July! The AJA are enormously grateful to the Carlisle Racecourse Executive for the launching of this new initiative with the raceday also featuring many other family attractions. Lady jockeys will also be able to enjoy Carlisle’s new Weighing Room facility which will by this time be newly opened. We look forward to a great day’s racing which we hope will feature in our racing calendar for many years to come. CIARAN HARRIS enjoyed a 20/1 winning ride for his family (and the second winner of his career) in the first of the 2010 Bollinger Champagne Challenge Series at York’s Spring Meeting this afternoon. In a thrilling finish he managed to pass the post half a length in front on Sedgwick with MILES SESTON second on favourite Mr Freddy and JOSH MOORE 8 lengths back in 3rd on Red Kestrel. Winning owner Wilf Hobson was not at the Knavesmire and so the trophy was collected by his daughter, Mrs Debbie Harris, wife of the successful trainer and mother of the winning jockey. The proud family took home a bottle of Bollinger champagne with Ciaran taking home a magnum. York now looks forward to seeing the lady amateur jockeys in action in The Queen Mother’s Cup on Saturday 12th June when they host the 40th Macmillan Charity day. The first race of Newbury’s evening meeting was a mixed amateur race with 12 runners which produced another good finish. Congratulations go to PATRICK MILLMAN on his father’s Mustajed who stayed on well from a furlong out to win comfortably just over a length in front of VICKY FAHEY and Bajan Pride with BEN MORRIS on Rock Relief a further 2 1/2 lengths back in third. Many congratulations to all of today’s winning connections. How heartening to see that out of all the fields today at Wetherby (the total number of runners in each race being 6, 7, 5, 5, 14, 6, 5), the pro/am ladies hurdle has the strongest support with 14 runners, 13 of whom are amateurs with Gemma Gracey-Davison (our Fegentri representative in 2008 and fresh from her splendid winning ride on Monday at Towcester) being the sole representative of professional jockeys.Sunday’s ladies hurdle at Market Rasen is for amateurs only and has 23 entries. This race provides a great opportunity for lady amateurs holding a Category A jump licence to gain experience on the racecourse and build up the necessary criteria (15 completed rides under Rules or 20 placed (1st, 2nd or 3rd) point-to-point rides or a combination of the two) towards gaining their Category B licences. All amateur jump jockeys holding a Category A licence who attend and pass the Category B course at either the British Racing School or the Northern Racing College should be aware that the issue of their Category B licence is not automatic as this criteria of completed/placed rides must be strictly adhered to. 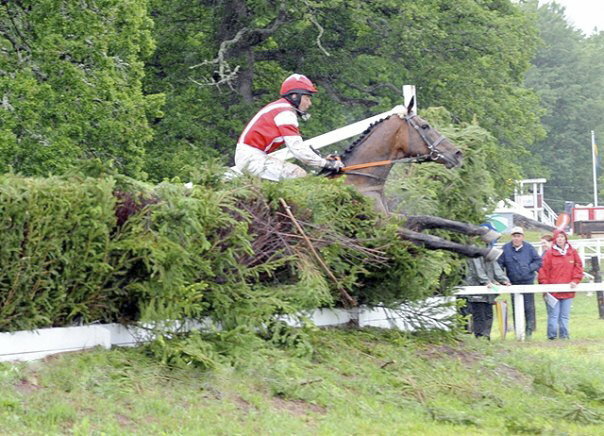 Ian Chanin‘s experience (above) in last year’s Swedish Grand National has to qualify as one of the best Fegentri photographs ever taken! HARRY CHALLONER and RUTH JEFFERSON are enjoying representing Great Britain this season as our respective gentleman and lady amateur rider in the FEGENTRI series and up until yesterday they had been lucky enough to have escaped any disruption caused by the volcanic ash. 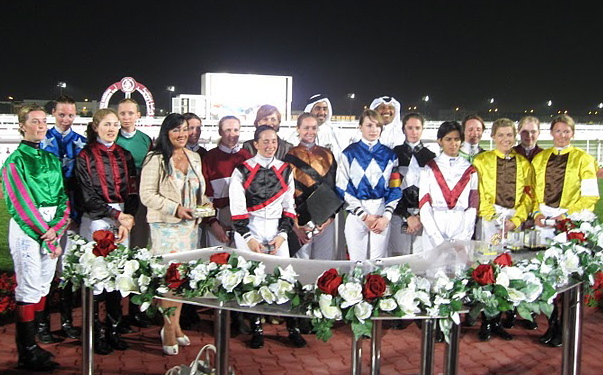 Ruth (pictured above 7th from left in Doha) was stranded in Zurich yesterday but returns home this morning having ridden into 3rd place at Frauenfeld which puts her in 3rd place overall in this year’s ladies’ ranking for the Fegentri World Championship. 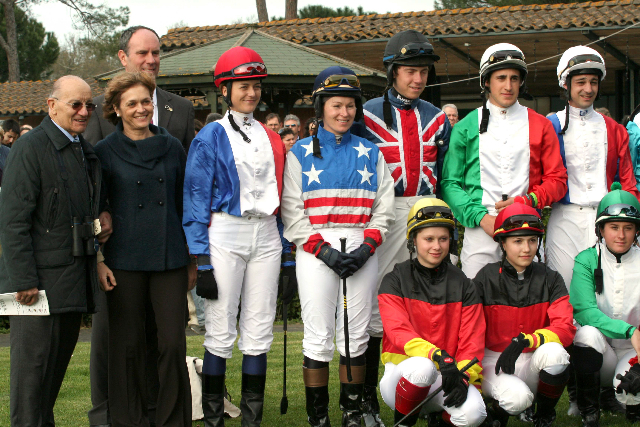 Ruth has enjoyed rides so far in Siracusa, Doha (together with Zoe Lilly pictured above 4th left), Mannheim, Dusseldorf, Rome, Mon-Ghlin and Frauenfeld. She travels next to Norway on 10th June and on to Philadelphia the next day. Meanwhile Harry retains 4th place in the gentlemen’s ranking, which is a considerable achievement considering that he missed out on rides in both Belgium and Spain this week through no invitation. 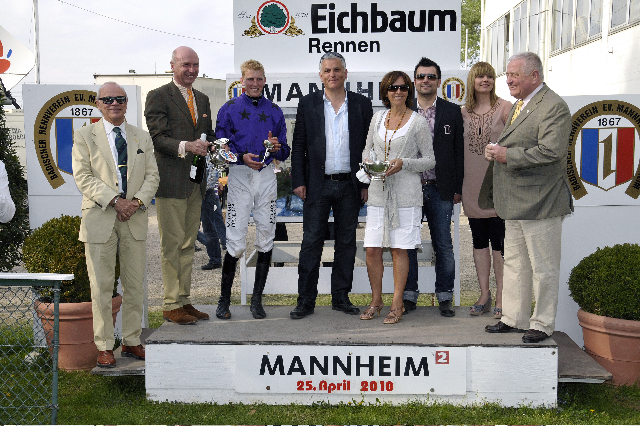 He won by 18 lengths riding against professionals on MY FIRST CHESTNUT in Mannheim on 25th April for Germany’s champion trainer Christian von der Recke (outside the Fegentri series). Harry has enjoyed rides in Cagnes-sur-Mer, Fairyhouse and Mannheim so far and hopes to ride in Auteuil at the end of May before joining Ruth in Norway on 10th June. The Union Jack colours were worn in Pisa by Oliver Murphy at the end of March. (Unfortunately Wendy Gibson’s ride was a non-runner). The Union Jack will be worn by Lucy Alexander and Rob Kirk in Maisons-Laffitte this weekend in the second race of the World Cup of Nations series when Paris host an inaugural FWCN race there. The AJA look forward to hosting 4 Fegentri races this year in England: Nottingham (3rd July) Ladies Flat; Stratford-upon-Avon (21st August) Mens Hurdle; Royal Windsor (28th August) Mens Flat and Goodwood (29th August) World Cup of Nations. 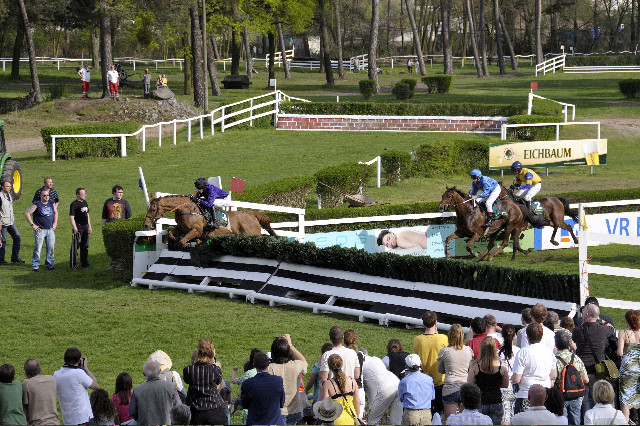 If you would like to represent your country by riding in a Fegentri race and are a member of the AJA, it is a prerequisite for you to have ridden a minimum of 5 winners (preferably all under Rules, although Arab and point-to-point rides help). Please contact the AJA if you would like to add your name to the Fegentri list of potential riders. 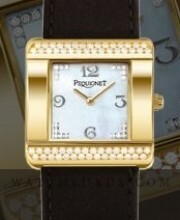 For more information on Fegentri please visit www.fegentri.com. With the end of the amateur jump season looming as Stratford’s 29th May meeting fast approaches, the gentlemen are led by OLIVER GREENALL, currently on no less than 31 winners so far this season. After taking a strong lead over the summer following on from taking last season’s championship, Oliver has clocked up an incredible total so far and his nearest rival, Matt Griffiths, is unlikely to be able to threaten him with 11 winners to date. Many congratulations to Triple Flat Lady Champion Jockey Carol Bartley and her husband Gary on the birth of their son Archie James on Thursday 6th May at 7:12 pm weighing in at 7 lbs 8 oz. Mother and baby are doing well and we look forward to seeing Archie in the saddle before too long!